Explore the vast lands of Krelaila in order to stop the invasion of the Rebonites, an otherworldly race. 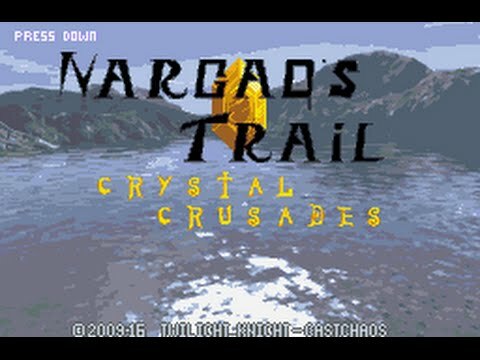 Travel together with Nargad through a huge overworld and 9 big dungeons, with an occasional sidequest for a nice reward. 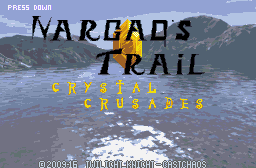 This is the sequel to Nargad's Trail: Argon's Evil Lair, but the gameplay and concept is quite different from NTAEL. The quest doesn't put much emphasis on story, but instead focuses on an emerging world to explore. Besides that, there are 8 classical dungeons by CastChaos featured in this quest and 1 big final dungeon. A compelling story, but no heavy cutscenes! A vast overworld, countless hours of exploration. 8 Mysterious dungeons, all with a puzzling, unique theme. 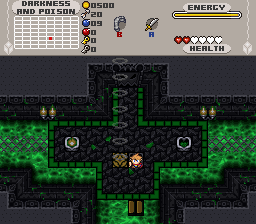 1 Final dungeon, with two possible endings. Refined interiors, including royal palaces, many houses and hidden caverns. 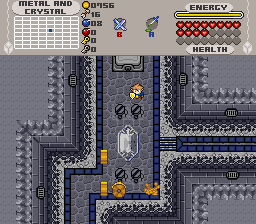 A heavily modified version of DoR 1.0 as tileset. Orbs of Fierce and Argon explained. Custom bosses, with fun gameplay. Many scripts to make the game smooth. Energy resource instead of mana. The lands of Krelaila are under attack by a dreadful army called the Rebonites and Nargad is sent to retrieve an ancient artifact in order to stop that army. Unravel the mysteries about Argon and the Orb of Fierce. Learn more about Krelaila's past and find out who your true enemy is. Exploration is key in finding Heart Container Pieces, nice money rewards or upgrades. You always get a hint where to go next after each dungeon, so be sure to pay attention to the text! The road to level 2 is very long, so prepare for a long travel. Pay much attention to what Frozenblood says after each dungeon. He will usually give you a direction on what to do next, even if it seems irrelevant. So this quest, it sure is something. I was actually a bit torn what to rate it, but more on that later. Let's start with what's good. First, the overworld. This may just be the best overworld in ZC. It's big, it's varied, it's interconnected, and it's full of secrets and sidequests. 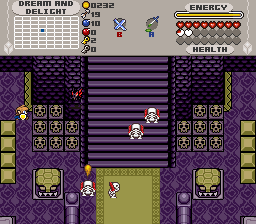 Honestly, even if the quest lacked any dungeons at all, I think it would still be an amazing quest based off the overworld alone. You've outdone yourself Twilight Knight. It's truly spectacular. The world itself. Unlike most quests, I actually felt somewhat invested in the world. It feels like a real world you're exploring, not just a collection of maps. The NPC dialogue is also incredibly funny most of the time. There's also the attention to detail. Just little things like the sunglasses or hat that you can wear add a lot of detail to the world. Or things like talking to the trees after completing the nature sidequest, or the "gypsies" (which was a brilliant twist tucked away in an obscure line of NPC dialogue). Of course, there's also the graphical style. I don't how much I can say here. It's good. It's really good. I love what you did with the Pokemon mountains combined with old-school DoR. It's got a unique graphical style that's fantastic. The dungeons... the dungeons I'm mixed on. Some of them, namely 2, 3 (especially 3), 5, and 6 were great. There was certainly a bit of style clash going in terms of design philosophy (i.e. it was really clear I'd walked from a TK quest into a CastChaos quest), but they were CastChaos at his best. I feel they incorporated everything I like about CC's design philosophy (the creativity, the surrealism) while eschewing all the bad (confusing triggers, cluttered rooms, etc). 7 and 8 weren't bad, but they had some minor annoyances. 1 and 4... Not a fan of anything in 1, really, and 4 did some annoying side warp shenanigans I'm not too fond of. The final dungeon was cool, but relied far too heavily on backtracking. In general, the dungeons were what I want to see from CC, but there were a few missteps along the way. Custom bosses were kind of hit or miss. While 2.10 bosses have basically fallen from favor, some of them were pretty nice in a nostalgic sort of way. The boss of level 3 especially comes to mind. Her sweeping the room with lasers was really fun. But a lot of the later bosses seem to quickly devolve into hordes of enemies or bosses that stood in one place doing nothing. It was kind of disappointing whenever that happened because I know CC can do better than that. With the final boss, for example. He has a phase where he just summons enemies, which was boring. And then suddenly there's bullet hell patterns and giant energy blasts and escape sequences and it's awesome. It seemed weird that even within the same boss fight, there could be such exciting and such dull moments. Frozenblood. It was so painfully obvious he was evil right from the get go. Like... his name is Frozenblood. Frozen Blood. As time went it, it became more and more obvious, to the point where I was hoping the big twist was that he wasn't evil. So in that sense, the big reveal was pretty disappointing. While we're on the subject of the story, there's an elephant in the room I feel like we have to address. We all know English isn't CC's native language, and his writing can be awkward at times. In his solo quests, I look past that because I know he's doing the best he can do. But in a collab project like this, it was incredibly noticeable every time a CC string showed up. I feel like I could point out every single string he wrote. I have no objections with CC writing part of the plot, but I don't understand why TK didn't edit his strings from grammar afterwards. It seems like a simple thing that would've done wonders for immersion. So where does that leave us? A quest with a well-constructed world, the best overworld I've seen in ZC, dungeons that range from "not perfect, but pretty good" to "well it's not awful but it's not really good either", an average (albeit unique) story, decent 2.10 bosses, lots of interesting secrets, and a one-of-a-kind graphical style. I feel like, overall, it should come out to a 4/5. But the weird thing is that, for me, it feels like the quest is more than the sum of its parts. It's got its fair share of mistakes, don't get me wrong. But those mistakes never really stopped me from enjoying it. Even at it's worst, when I had to skim the help thread to find some obscure secret in a dungeon, it never felt like any more than a stumbling block to keep me from reaching the next awesome bit of world exploration again. So I'm giving it a 5/5. That doesn't mean the quest is perfect by any means, but it appeals to me in all the right ways. Great job, both of you. Im giving this quest 5 stars because not only did it draw me back into zc again, but there was a lot of work that went into this project hopefully I can start my big review didn't have much of a chance yet. Anyways great Job with this compelling and extensive quest def one of my top 5s for sure! This quest was certainly unique in many ways, and an enjoyable enough 24hours of game time, but in my opinion, is very oddly balanced and deceptively hollow. The biggest balance issue is the long, long journeys to the 1st and then second dungeons. This in and of itself isn't the worst thing in a quest that is created with exploration in mind. 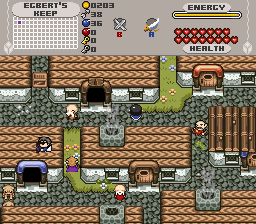 On the other hand, surviving the overworld and trekking long distances to the first and second dungeons eclipses the difficulty of the actual dungeons. The first, second, and to a lesser extent third dungeons are simply underwhelming compared to the journey just to reach them. 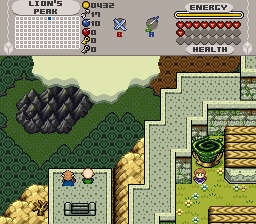 Once you pick up certain items, you figure out this journey, and the rest of the overworld isn't really that big. 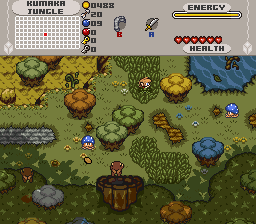 The overworld just seems that way early on due to lots of hammer pegs, rocks, or other obstacles forcing you to take the long way. The other balance issue I felt to be a problem is that it just didn't seem worth it to explore much until late in the game. This is because of an abundance of item triggers to get HCPs, but also because the quest throws large amounts of rupees at you when itsnot possible to get the 999 or 9999 wallets until relatively late in the game. For a quest created with exploration in mind, there just seems to be little incentive to do so until too late in the game. The quest's difficulty quickly dropped from average to quite easy after I found a certain armor upgrade after level 6, and free sword upgrade in level 5. I guess this would be moot if the player never finds combat-upgrades. 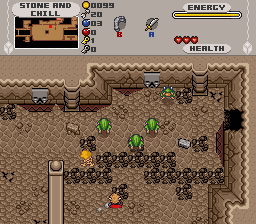 The dungeon design is slightly above average with no major flaws I can remember. 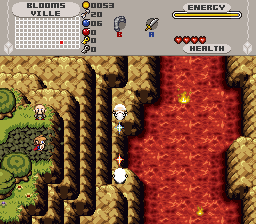 The music choices and themes of each dungeon somewhat pale in comparison to the attention given to the overworld. Due to the sword and armor upgrades I found, the levels seem to grow progressively easier, instead of harder, with the late dungeon bosses a total pushover. Overall, this is an enjoyable quest with some quirky design philosophies that somewhat subtract from, but don't nullify the experience. 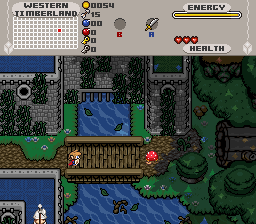 The overworld is quite splendid, but you have to progress far into the quest's less splendid dungeons before you can take full exploration of that overworld. As a betatester, I really enjoyed this quest, also think it have a big problem. I love to explore aimlessly on overworld and NPC's conversations even about their own life. As I often use the lens of truth item, so like energy resource idea. Traveling system is expensive and it will be useless after get many items to open shortcut. I guess many general players or even some experts can't reach Lv2, think it's a big problem if this quest was made for general. I would like to give 5-stars subjectively, think 4-stars is suitable objectively. Though reaching Lv2 is so difficult, I believe this quest is really great and exciting. I really like you quest you and CC made. It was fun and entertaining, surprising and challenging. 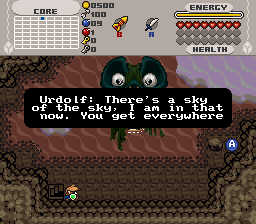 The overworld was pretty amazing. I liked the different areas. The bosses were quite different. They weren't too difficult once you figured out how to beat them. Level 1 did seem like it was cluttered, what to bomb and not what to bomb. The arrows were a little small but I do have to say once you saw the arrow and the place to bomb, it was more noticeable. For me that is. I would play it again, but not right away though, that trip to level 2 wore me out. Next time I know I'll have to pack a lunch. It takes a lot of work to make a quest I know I've tried and it's still on the drawing board. I think you and CC did a great job. Even with the few errors I found I still would have to give it 5 stars. Thank you and CC for making it. Thanks for the updated file ,i will play this again ,since i just love it.. If we are lucky we get one good game a year, and this is it everyone! Going to be trying out the quest when I have less school work. I've been waiting for this quest for a long time now and I can't wait to try it out! Oh crap, i start login less and less often and the quests i'm following start to get submitted. Welp, downloading time.